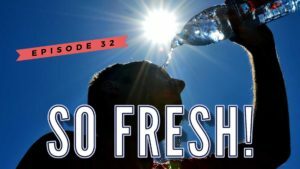 Episode 32 – Macron keeps it cool during heatwave – So French! and ask the question what Europe will look like under the new french president. Will Emmanuel Macron be a refreshing force, or will the warm relationship between Germany and France cool down once the UK leaves the union? Other topics: France is getting older and older, Paris wants to host the 2024 Summer Olympics, and Maud Descamps brings us a steaming hot So French word! Recorded in Paris, Friday 23 June 2017.